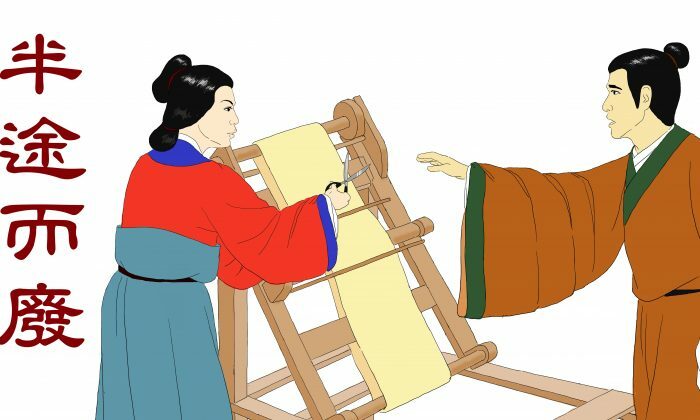 The idiom 半途而廢 (bàn tú ér fèi), “give up halfway,” or leave something unfinished, originates from “The Doctrine of the Mean (1),” one of the four Confucian canonical scriptures. As the story goes, during the Warring States period (475–221 B.C. ), there was a man named Yue Yangzi who lived with his wife in the state of Yue. One day, Yue Yangzi saw a piece of gold in the road and picked it up. He took it home and showed it to his wife. Hearing this, Yue felt ashamed and took it back to where he had found it. Yue then decided to search for scholars and enrich his knowledge. With support from his wife, Yue set off. Without saying anything, his wife picked up a pair of scissors and went to the loom where she had been working. Yue was deeply moved by what she said. He left home again; this time determined that he would not give up halfway through his studies. Several years later, Yue became a very learned man. This idiom is used to refer to an action that stops in the middle of the process. It warns that all one’s efforts will be wasted if one cannot see things through to the end.